Home → Basement Mold → Flooded Home? Here’s How You Can Keep It From Happening Again. I first wish to express my heartfelt sadness to all those affected by the recent flooding. This past year my family was displaced from a broken water pipe. As a result, we were forced to live in a hotel for six months. I have always seen the effects of water. Since our out-of-home experience, however, I have learned a whole new empathy for people in flooding situations. Once again, my heart is with you. Take a walk around your home and evaluate your grading situation. Homeowners should do a walk-around to ensure thatthe grade work around their home slopes away from their foundation wall. When able to, you should elevate your grade 10-12 inches high and 10-12 inches out. You should be able to see where your drip edge is on the ground where the water comes off the roof and makes erosion lines in your backfill. This is where you should start your grade and build up inward toward your foundation wall. Anything outside of this line will simply be eroded away. Inward of this line, once you build up your grade, water coming off your roof, or running toward your foundation will not climb this berm, simply will flow in another directions away from your wall. Simply get sifted topsoil, which will be clay based. Once you have built up the dirt to the foundation wall, tamp and tamp well. Density is the key to keeping the dirt there. You may also wish to cover with stone to prevent erosion. I am not a real fan of gutters; however they do have their place. Keep in mind however, when the gutters fail and overflow for their capacity limitations, you will still need to have your grade in place. Check for other avenues of water entry into your basement. 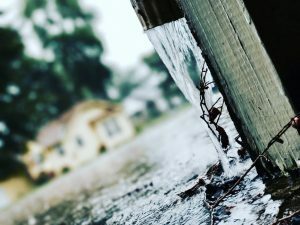 While all this rain is fresh in your mind, make your check list and act now before the fear of another flash flood dissipates from your memory. If you have windows that are at or below grade and they filled up with water, emptying into your home, then this is the time to remove the windows and fill that space with concrete block. This will allow you to adequately build your grade high enough to establish that ever important berm of dirt. I would never leave a hole in my boat at the water line, so why would I have windows below the grade line? These simple tips can go a long way in preventing flash flooding entering your basement. If you have any questions for concerns, please feel free to contact our office from our web site. Does your basement feel exceptionally humid this year? If so, it’s no surprise. Dew points have been close or above 70 degrees with humidity levels well over 90 percent, rain equals 100 percent. This excess humidity will result in condensation and the darkness found in most basements will be the prime growing environment for growing all types of mold. ‘Tis the season to run dehumidifiers and leave your windows closed. If humidity is a big problem, you’ll need a little more help. For better protection for mold growth, visit our web site for the Humidex, the modern smart way to remove humidity from your home. If you mention you read this from our blog, I will discount the installation 10 percent for you. Here is another tip, Wal-Mart has 4-packs of 100 watt LED lights, each putting out 1500 lumens. Install your basement and leave them on from the end of April through the end of September. They burn 10 watts a piece, a glorified night light. Leave them on 24/7, because mold needs darkness to grow and these lights help prevent that. Family members with respiratory ailments will thank you!